Surprise your loved ones ! Offer your loved ones our Pass’Ports gift pouch, a simple and original gift ! Order your gift pouch online. Our team will make sure to send you it by post to your address under 24 to 48 hours. The lucky person receiving the gift pouch will just have to choose the date of their crossing and call us to book. Our Penn Ar Bed gift pouches are valid 1 year from the date of purchase. The round trip can be done in a day or a couple of days. 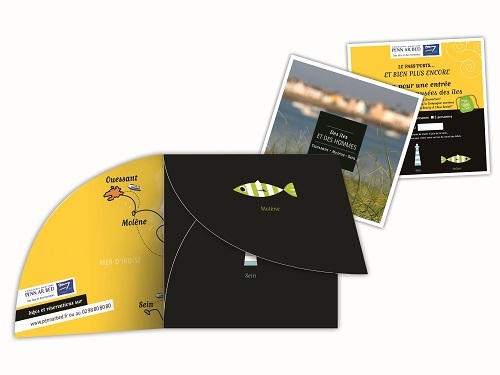 2 round trip tickets to discover Ushant, Molène and Sein. A « Des îles et des hommes » booklet which will unveil some magical and authentic places on the islands. At last but not least : 1 entrance for one of the islands’ museums ! What type of gift pouch can I purchase ? For 1 or 2 people, you can also purchase gift pouches for children aged 4 to 16. Where can I purchase these gift pouches ? Our harbour stations are open on weekends, even on Sundays ! Inscribe to our newsletter to receive all our offers on our gift pouches !